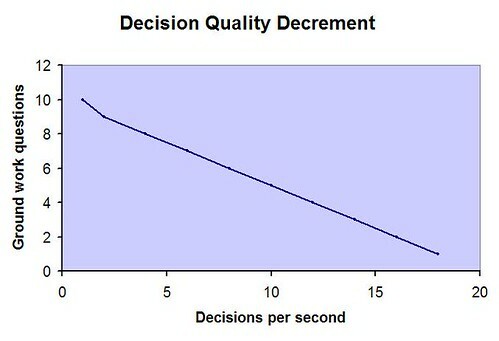 Decision quality is inversely proportional to the rate of decisions made and directly proportional to prior experience of making similar decisions provided the hormone level remains constant which the bugger never does. This scribble was published on Saturday, October 27th, 2007. You can follow any banter on this scribble with the RSS 2.0 feed. You can leave a response, or trackback from your own site.